Like two good neighbors, Hans and Franz have appeared from a Saturday Night Live sweat-dream to peddle insurance—and entertain us again after a few decades of hibernation. 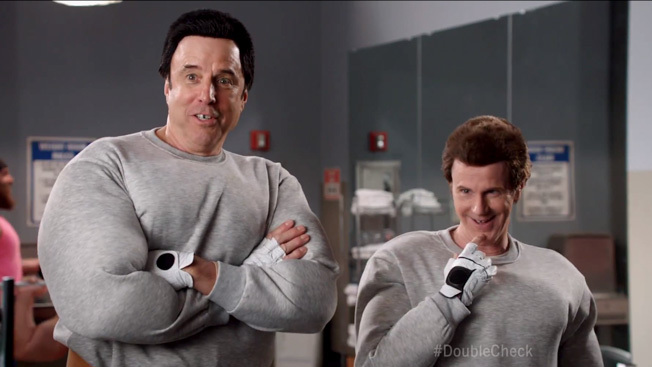 State Farm and DDB Chicago trump their previous (yet still funny) SNL character resurrection with this gem of a 60-second spot featuring comedy legends Dana Carvey and Kevin Nealon in their Austrian bodybuilder alter egos. Perfectly synced to the start of the NFL season, they team up with Green Bay Packers quarterback Aaron Rodgers, a longtime State Farm endorser, and repay him for saving them money on insurance. "Hear me now and believe me later! You pumped up our wallets with the Discount Double Checking, so we want to repay the favor and PUMP [clap!] … YOU UP!" Franz shouts at Rodgers in an amusingly clumsy blend of State Farm's branding and the characters' classic catchphrase. Watch below as Carvey and Nealon prove they're still in prime shape.